The ancient Egyptians built the pyramids to inspire awe, but could they have known that they would also inspire idiocy? For millennia, individuals have gazed upon these edifices, seeing them not as they are, but as projections of their own beliefs. Here are ten of the strangest theories—no aliens required. Medieval Europeans believed the pyramids were granaries described in the Old Testament. Egypt's pharaoh was disturbed by dreams in which seven lean cows devoured seven fat cows and seven withered ears of grain consumed seven healthy ones. Joseph interpreted the dreams to mean that there would be seven years of abundance in Egypt followed by seven years of famine. He advised pharaoh to begin storing surplus grain. I will speak about something else that is beyond Babylon across the Nile River towards the desert between Africa and Egypt: these are Joseph's Granaries, which he had made to store the wheat for hard times. They are made of well-hewn stone. Two of them are amazingly large and tall and the others are not so big. And each granary has an entrance for going inside a little above the ground, for the land has been ravaged and ruined since the granaries were built. Inside they are completely full of snakes; and outside on these granaries are many writings in different languages. Some say that they are tombs of the great lords of antiquity, but that is not true....if they were tombs, they would not be empty inside, nor would they have entrances for going inside, nor are tombs ever made of such a large size and such a height—which is why it is not to be believed that they are tombs. A depiction of the Egyptian pyramids as Joseph's granaries appears in a 12th-century mosaic on one of the domes of St. Mark's Basilica in Venice (see photo above). In 1859, a British publisher named John Taylor published his own book, The Great Pyramid: Why It Was Built and Who Built It. Taylor had never seen the Pyramid of Giza, but, after studying its measurements—which had been compiled by Oxford astronomer John Greaves and the French engineers who had accompanied Napoleon during his expedition in Egypt—he concluded that the massive structure was a repository for the "divine system" of all mathematical truths. Taylor's elaborate calculations included the observation that, if you divide the pyramid's height into twice the side of its base, you end up with a close approximation of pi. And, he argued that the structure was built using a unit of measurement he called the "Pyramid inch," which was one twenty-fifth of the "sacred cubit" and nearly identical to the British inch. Taylor cited this as proof that the modern system of measurement was divinely inspired. Taylor believed that Noah, not the Egyptians, was the true architect: "He who built the Ark was, of all men, the most competent to direct the building of the Great Pyramid." There seems to be something bordering on the ludicrous in the ascription to a man situated as Noah was at that time—a man just escaped from a catastrophe so frightful as the destruction of the whole human race…to begin anew the battle of life amid the wreck of a ruined world a project so wild, so almost stupidly idiotic, as that of heaping up a pile of massive rock a million and a half cubic yards in volume. Inspired by John Taylor's writings, Charles Piazzi Smyth, the Astronomer Royal for Scotland, undertook his own studies. He concluded that there were even greater divine truths encoded within the Great Pyramid than Taylor had realized. Smyth's 664-page book, Our Inheritance in the Great Pyramid, published in 1864, "revealed" that Biblical prophecies had been embedded in the architecture. When the passageways are measured in pyramid inches, he argued, one could find a complete chronology of the Earth's history, both past and future. Smyth claimed, for instance, that the beginning of a sloping passage called the Grand Gallery marked the birth of Christ and—33 inches later—the Crucifixion (the number 33 corresponding to the year of Christ's death). Depending upon how one measured the complete length of the Grand Gallery, it terminated at a point between 1,881 and 1,911 pyramid inches. Smyth interpreted this to be the period of Great Tribulation preceding the Second Coming of Christ. The distinguished astronomer, as every one knows, has long since proved to his own satisfaction that the pyramid is a neat and handy compendium of history and prophecy…In the great gallery of the pyramid, which, according to this theory, represents the Christian dispensation, there are precisely eighteen hundred and eighty-one notches… hence if the pyramid is trustworthy and really knows its business, we have arrived at the last year of the earth. There are a vast number of people who believe in this remarkable theory of the pyramid, and they are one and all perfectly sure that the pyramid cannot tell a lie and that the private judgment of Piazzi Smyth when interpreting the pyramid is infallible. These pyramidal Christians are, therefore, preparing themselves for the Last Day, and in case they should happen to be disappointed and to be under the unpleasant necessity of making New Year's calls in the snow on the First of January 1882, they will probably blaspheme the pyramid and lose all faith in man and stones. Joseph T. "Judge" Rutherford, a leader of the early Jehovah's Witness movement, was determined to put an end to the "Christian Pyramidology" espoused by his predecessor, Charles Taze Russell. It is certain that the pyramid of Gizeh was not built by Jehovah God; nor was it built at his command. It is more reasonable to conclude that the great pyramid of Gizeh, as well as the other pyramids thereabout, also the sphinx, were built by the rulers of Egypt and under the direction of Satan the Devil. Then Satan put his knowledge in dead stone, which may be called Satan's Bible, and not God's stone witness. In erecting the pyramid, of course, Satan would put in some truth, because that is his method of practicing fraud and deceit. Satan is a wily Foe. He resorts to all manner of schemes to draw men away from Jehovah and his service. One of the most subtle schemes Satan has yet adopted to accomplish that purpose has been and is the use of the pyramid of Gizeh. There are those who rely upon the pyramid who claim to be of Christ and his followers. We now wonder why we ever believed in or devoted any time to the study of the pyramid of Gizeh. Not only will we abandon such a study now, but we will ask God to forgive us for wasting the time that we put in on it and redeem the time by hurrying on to obey his commandments. The object of the paper was to establish the fact that pyramids were built from the top downward…The theory is that the pyramids were isolated hills, used as quarries from which stones were drawn for edifices, and hence the excavations. The hills were, in the course of time—under the management of competing engineers—cut into pyramids as they now appear. There are instances where isolated hills are found, and the theory is not in that respect wholly incredible. That sovereigns conceived the idea to have the old quarries cut in shape so as to become monuments commemorating events is not at all improbable. The idea may be the correct one, and if established will explain many things which have been real mysteries to this day in regard to the monster structures known as the Egyptian Pyramids. That there once existed in the Atlantic Ocean, opposite the mouth of the Mediterranean Sea, a large island, which was the remnant of an Atlantic continent, and known to the ancient world as Atlantis. That the description of this island given by Plato is not, as has been long supposed, fable, but veritable history. Donnelly argued that, at the height of their civilization, the Atlanteans established colonies around the world—and that the oldest of these was probably in Egypt, "whose civilization was a reproduction of that of the Atlantic island." The pyramids of the Old and New Worlds do not look the same. New World pyramids are truncated with ﬂat tops (that is, their four faces are not triangles, they are trapezoids), while Egyptian pyramids are true geometric pyramids (four triangular faces joining at a common apex). New World pyramids have stairs ascending their faces, Egyptian pyramids do not. New World pyramids served as platforms for temples; Egyptian pyramids were burial chambers for dead pharaohs (only a very few Mesoamerican pyramids contain burials). The construction methods were different; most Egyptian pyramids represent a single construction episode, whereas Mesoamerican pyramids usually represent several building episodes, one on top of another. Finally, if Mesoamerican and Egyptian pyramids are hypothesized to have been derived from the same source (Atlantis or elsewhere), they should date from the same general period. 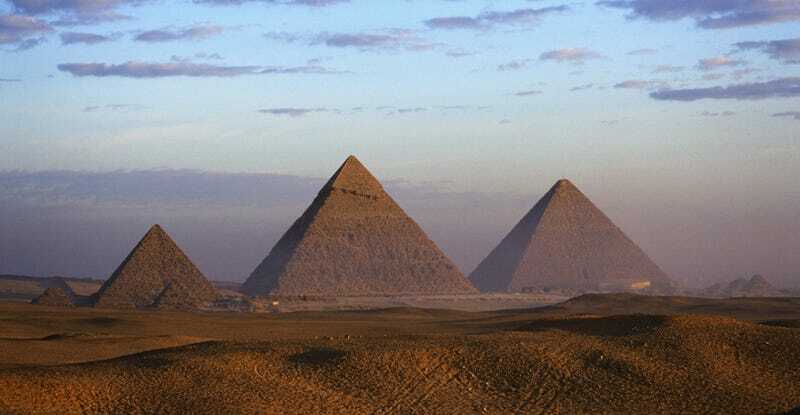 But Egyptian pyramids were built between about 5,000 and 4,000 years ago. Those in Mesoamerica are all less than 3,000 years old—and most are considerably younger, dating to less than 1,500 years ago. Furthermore, the pyramids on both sides of the Atlantic date to well after the supposed destruction of Atlantis some 11,600 years ago. Goerlitz and Erdmann acknowledged their acts, and even went so far as to post photographs and videos of themselves vandalizing the archaeological sites. However, they claimed their goal was a noble one: to prove their "alternative history" conspiracy theory that the pyramids were not built by ancient Egyptians. The men are apparently convinced the cartouche identifying Khufu as the creator of the Great Pyramid at Giza is a fake, and they hoped to do an analysis on the pigments to prove they were not as old as the pyramids themselves. In essence, they claimed, pharaoh Khufu simply put his name on (and took credit for) pyramids that had been built thousands of years earlier by people from the legendary city of Atlantis. They accuse mainstream archaeologists of covering up — or willfully ignoring — evidence pointing to non-Egyptian origins of the pyramids. Gamal [said] Israel does not send its own Jewish archeological teams to Egypt because that would expose its plot. Instead, Israel sends missions to Egypt "under the guise of other nationalities" while making sure the leaders of the foreign-archeological missions are Jewish, he said. In addition to claiming the Jews constructed the pyramids, Gamal said Israel is plotting to prove that the Egyptian King Sheshonq I, the founder of the 22nd Dynasty in the middle of the 10th century BCE, was the Biblical King Shishak. Biblical accounts say Shishak invaded Judah during King Rehoboam's reign and took treasures from the First Temple in Jerusalem. Gamal believes Israel is seeking to claim that gold and jewelry found at an ancient burial site at Tanis in Egypt are part of Solomon's treasures. This is not the first time the alleged role of the Jews in ancient Egyptian history has caused controversy in Egypt. Earlier this year, Egyptian journalist Ahmad al-Gamal called on Cairo to sue Israel for the costs of the 10 deadly plagues visited on the Egyptians during the time of Moses. And, in 2003, a prominent Egyptian legal scholar announced he was preparing a lawsuit against Jews around the world over gold that was stolen during the exodus from Egypt. Levitation appears as a common theme among fringe pyramid theorists. The famed psychic Edgar Cayce—who believed the pyramids were built by a consortium of Atlanteans, Egyptians and Caucasians from southwest Russia—claimed the ancients used their extraordinary mental powers to lift the massive blocks into place. Inscribed magical papyri were inserted beneath the stone blocks used in the construction of the pyramids, before the latter were struck by an instrument of some sort, plausibly a rod or stave. Somehow this induced them both to rise into the air and travel for a distance of "a bowshot." By striking the stones, the Ancient Egyptians were able to set up some kind of sustained sound vibration that enabled the building blocks to defy gravity and move over the ground for a distance of around 86.5 meters, before they would have to be struck again to achieve the same result. After producing an initial thrust, they would have been able to take advantage of Newton's First Law of Motion." Recent (legitimate) research into the field of "acoustic levitation" has been seized upon as further evidence that the Egyptians—along with the builders of Stonehenge and the statues on Easter Island—had mastered this science. Astronomy played a role in the design and construction of the pyramids. The great pyramid of Khufu, for instance, contains four shafts aimed toward the meridian in the sky. When it was built (2,500 BC), these shafts were aimed at the transit points of Thuban, Sirius, Kochab and Orion's Belt. Apparently, the shafts served to direct the spirit of the dead pharaoh towards these key stars. Thuban and Kochab were circumpolar "Imperishable ones" (stars that never die), while Orion represented the deity Osiris and Sirius his consort, Isis. But Robert Bauval, in his book The Orion Mystery, took Egyptian astronomy a step further, claiming that that there is a correlation between the location of the three largest pyramids of the Giza pyramid complex and the three stars that form Orion's Belt. However, that alignment would only be possible if the pyramids had been built 12,000 years ago. The "Orion correlation theory" remains popular, though it's been debunked by two prominent astronomers. Readers of The Orion Mystery are shown an aerial photograph of Giza paired with a picture of Orion's Belt. There is something wrong with these images, however. The picture of the pyramids is oriented with north at the bottom of the page. Orion's Belt, on the other hand, has north at the top. To make the pyramids match the sky, you have to turn Egypt upside down. In fact, all of the book's maps of Egypt are published upside down, with south at the top. Although an Orion-mystery enthusiast might argue that the inversion is not really significant, or that the Egyptians deliberately upturned their constellation for arcane reasons known only to them, these rationalizations won't fly. My own investigation showed that, while the line of the two outer pyramids is set 38 degrees from north, the angle of Orion's Belt to north in 10,500 BC is close on 50 degrees! Hardy an exact match. Bauval's choice of 10,500 BC (when Orion is furthest south in its precessional cycle) also supposedly fits with the Milky Way aligning with the Nile. But the course of the Nile is variable, and we do not now know where it ran in 10,500 BC with any accuracy. The idea that the very shape of the pyramids makes them capable of harnessing regenerative powers probably traces its origins to the first discoveries of the well-preserved mummies in Egypt. In the early 20th century, French researcher Andre Bovis tested the theory by building a scaled-down replica of the Great Pyramid and placing raw meat inside to see if it rotted. Hearing of these experiments, Czech radio engineer Karl Drbal built a cardboard pyramid and claimed that it had actually sharpened his razor blades. In 1959, he was granted a commercial patent for his Cheops Razor Blade Sharpener. But, pyramid power's golden age was the 1970s. At the time, San Francisco-based writer Bill Sievert wryly observed that it was the perfect pop phenomenon for the Jimmy Carter era. "It's simple, it requires no great commitment, and anyone who can afford a piece of cardboard can participate." Depending on the literature and advertisements you read, there were no limits to what pyramids could accomplish: sharpen cutlery, age wine, remove the bitterness of coffee, preserve foods, purify tap water, strengthen TV reception, reduce pain and, of course, assist in meditation. "As has been the case so frequently during the past 500 decades," Sievert wrote, "pyramids can still make fools of many learned people."